Background: The most common risk factors for hepatocellular carcinoma (HCC) are hepatitis B (HBV) and C (HCV). Patients with HCV related HCC have biology and outcomes distinct from HBV related HCC. We evaluated whether there is a difference in time from diagnosis to treatment between HCC patients with HBV and HCV. Methods: We conducted a retrospective chart review to identify patients with confirmed HCC, and a known diagnosis of either HBV or HCV at Bellevue Hospital Center between January 2005 and December 2009. Medical records were reviewed for disease and treatment characteristics. Results: Seventy HBV patients and 76 HCV patients were identified. HBV patients were mostly Asian (87%), while the majority of HCV patients were Black and Hispanic (28% and 47%, p<0.0001). At diagnosis, the HBV group presented with larger tumors compared to the HCV group (median 5.3 cm vs. 3.1 cm, p=0.025), and HCV patients were older than HBV patients (median age 61.3 years vs. 50.7 years, p<0.0001). Patients with HBV related HCC received treatment quicker than their HCV counterparts (median 2.1 vs. 3.2 months, p=0.019). Conclusion: Patients with HCV related HCC wait longer for treatment when compared to patients with HBV related HCC in an urban inner-city hospital Efforts to reduce time between outside referral to oncology services may help decrease such disparity. Hepatocellular carcinoma (HCC) is a global burden which accounts for the 3rd leading cause of cancer induced mortality . In the United States (US), HCC is ranked as the 5th leading cause of cancer related death, and its incidence tripled between 1975 and 2005 . Although the incidence of HCC in Asians who account for most of the hepatitis B (HBV) related HCC has not changed, the mortality rate has declined due to successful treatment of HBV and early detection of HCC through surveillance [3,4]. In contrast, the incidence of HCC among Hispanic, Black and White men has risen sharply largely attributed to the consequence of HCV infection and the increase in obesity rates [2,5]. Viral hepatitis still accounts for up to 80% of all newly diagnosed HCC worldwide, and in the US, 60% of new HCC diagnoses were related to HBV or HCV [6-8]. HBV and HCV related HCC are distinct entities that differ in route of viral transmission prior to HCC diagnosis, latency period for the development of HCC, tumor size at diagnosis and mortality rate with systemic therapy [9-12]. These differences raise the question of whether time between diagnosis and treatment in HBV vs HCV related HCC is also different. In this retrospective chart review, we compared the demographic, social and disease characteristics between these groups then compared the time from diagnosis to treatment in HBV and HCV related HCC patients. After obtaining approval of the Institutional Review Board at New York University School of Medicine, we reviewed charts of patients with a diagnosis of HCC and HBV or HCV at Bellevue Hospital from 2005 to 2009. All patient outcomes were followed through December 2016. Variables collected included race, language, gender, cancer stage, BCLC score, Child Pugh Class, imaging type, tumor size, and type of treatment. Time from diagnosis to treatment, whether patient had a primary care physician (PCP) and the location of patients’ residence were also collected. Medically underserved patient populations are defined based on the geographic locations of patient’s primary residence according to federal standards by zip code. Patients live in such geographic locations have a shortage of access to medical providers, calculated based on Index of Medical Underservice (IMD). Delayed treatment is defined as receiving treatment more than 14 days after diagnosis. Reasons for delay were classified as follows: delayed referral to oncology, diagnostic workup or admission to hospital prior to treatment. The date of diagnosis was the date of biopsy when the specimen was confirmed to be HCC. For patients without a tissue biopsy, the date of diagnosis was the date of imaging (CT scan with intravenous contrast or MRI with contrast) that showed a hypervascular solid liver mass with features characteristic of HCC. Patient and disease characteristics were summarized for all patients by hepatitis type using descriptive statistics including medians and ranges for continuous measurements, frequencies and percentages for categorical measurements. Differences in the distribution of characteristics between HBV and HCV patients were tested using nonparametric Wilcoxon Rank Sum Tests for continuous measurements and Chi-Square or Fisher Exact tests for categorical measurements. P-values less than 0.05 were considered statistically significant; all p-values are 2-sided. One hundred fifty-five HCC patients were identified between January 2005 and December 2009, with 9 excluded due to coinfection with either HIV (5 patients) or infection with both HBV and HCV (4 patients). Of the remaining 146 HCC patients, 70 (47.9%) were HBV related and 76 (52.1%) were HCV related. Table 1 summarizes the patient characteristics by disease type. At the time of diagnosis, HCV patients were older than HBV patients (median age 61.3 years, range: 41.2-86.7 vs. median age 50.7 years, range: 23.8-81.7, p< 0.0001). Additionally, significant differences exist between HBV and HCV related HCC patients in racial distribution and language preferences. Eighty-seven percent of HBV patients were Asian compared to just 11% of HCV patients (p< 0.001). The top 2 racial groups in HCV patients were Hispanic (47%) and Black (28%). Twenty-seven percent of HBV patients and 25% of HCV patients received treatment within 14 days of diagnosis. No differences were detected between HBV and HCV groups with respect to patient location (defined as living in an underserved area) and PCP referral status. Table 1: Patient disease and treatment characteristics by hepatitis type. There were no differences in the distribution of HCC TNM stages between the 2 groups (p=0.335) shown in Table 2. No differences were detected between the 2 groups with respect to BCLC score or Child Pugh Class (p=0.227 and p=0.848, respectively). Pretreatment tumor size was significantly bigger in the HBV group compared to the HCV group (5.3 cm, range: 0-20.0 cm vs. 3.1 cm, range: 0.8-15.0 cm, p=0.025). Table 2 Disease stage, child Pugh score and type of imaging and treatment by hepatitis. A total of 80% and 70% of patients in HBV and HCV group received treatment, respectively. The rest of the patients in both groups received no active treatment (either palliative care or no treatment by patient preference) or lost to followup. No difference was observed between the proportions of patients who received treatment. Of the 56 HBV patients who received treatment, 45% underwent surgery, 23% received local therapy and 32% received systemic therapy. Among the 53 HCV patients who received treatment, 11% received a transplant, 11% underwent surgery, 55% received local therapy and 23% received systemic therapy. No difference was observed among the various types of treatments between the 2 groups. Among the reasons that contributed to the delay of time from diagnosis to treatment beyond 14 days, both groups had similar distribution. The most common reasons were delayed referral from diagnosis to oncology service, additional diagnostic workup and patient hospitalization prior to confirmation of diagnosis shown in Table 3. Table 3 Patients with time to treatment >14 days: Reasons for delay by hepatitis type. HBV patients received treatment more quickly after diagnosis compared to HCV patients (median 2.1 months, range: 0 to 32.8 months vs. 3.2 months, range 0 to 135.5 months, p=0.019) Shown in Figure 1. This difference persisted even after all patients who underwent liver transplantation in the HCV group were excluded from the analysis. 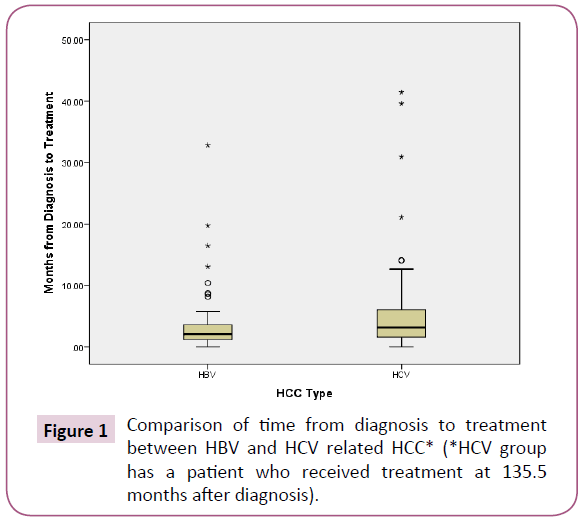 Figure 1: Comparison of time from diagnosis to treatment between HBV and HCV related HCC* (*HCV group has a patient who received treatment at 135.5 months after diagnosis). Due to smaller tumor size at presentation, there was a trend (statistically insignificant) that HCV patients were diagnosed at an earlier stage disease when compared to the HBV group according to AJCC staging (32% vs. 19% Stage I). Despite smaller tumor size at diagnosis, fewer patients in the HCV group underwent curative treatments compared to the HBV group. Even though HCV related HCC patients tend to have smaller tumors at diagnosis when compared to HCV related HCC, there has been no reports in the literature connecting the tumor size at presentation with the subsequent curative treatments among these 2 groups . In our study, the median age at diagnosis of the HCV group was 10 years older the HBV group, a phenomena that is consistent with the literature. In a retrospective study of 149 HCC patients with either HBV or HCV over 9 years at the same institution as our study (the Bellevue Study), the median age of HCV vs. HBV patients was 58 and 50 years, respectively. Although this difference was not statistically significant, up to 26% of patients with HBV was diagnosed under age 40, while none of the patients with HCV presented younger than age 40 (p< 0.001) . The difference in age at diagnosis of HCC between HCV and HBV patients was validated in a Korean study where 3232 patients were analysed from a national cancer registry . The median age of HCV patients was significantly older when compared to HBV patients (65.4 vs. 53.9, p< 0.01). Even though cirrhosis score as calculated by Child Pugh Class and BCLC score were similar in the HBV and HCV groups in our study; historically, HCV patients have more cirrhosis [14,15]. In a retrospective study looking at HBV and HCV related HCC over a 10 year period, 815 patients treated at MD Anderson Cancer Center were analysed. When compared to the HBV group, the HCV group had a higher percentage of cirrhosis (86% vs. 59.5%, p< 0.001) . Higher percentage of cirrhosis can contribute to a longer delay between time of diagnosis and treatment in the HCV group. Our study did not show a difference in cirrhosis between HBV and HCV group, this could be due to smaller sample size compared to published reports which may not truly reflect the biological difference between the 2 groups. Consistent with previous literature, HBV related HCC is mostly represented by Asians, while HCV related HCC is dominantly by Hispanic population in our study. Such racial difference is due to the differential rate of infection of HBV versus HCV among the 2 groups. The racial difference between HBV and HCV groups can lead to difference in the rate of diagnosis and treatment for HCC. Racial disparity in HCC exists in surveillance, as indicated in the SEER-Medicare database. Blacks have the lowest surveillance rate for HCC (12%). Hispanics also had a low rate of surveillance (17%), while Asians achieved the highest surveillance rate (28%, p< 0.001) . A similar trend was observed in a retrospective study in a safety net hospital in Texas, demonstrated that African American patients with risk factors for HCC had the lowest rate of surveillance . Such differences are reflected in the lower curative treatment rates among Blacks and Hispanics in the California Cancer Registry. Hispanic patients were less likely to receive curative treatment due to lower rates of surgical resection than their Non-Hispanic white counterpart (p< 0.01). When compared to Non-Hispanic Whites, Black patients were 58% less likely to get curative treatments such as liver transplantation, and were 36% less likely to undergo other curative therapy such as surgical resection [19,20]. This trend was demonstrated in our retrospective study as well. Of the patients who received treatment, 22% of patients with HCV related HCC underwent curative modalities which included liver transplantation and surgical resection compared to 45% of HBV related HCC patients (p< 0.001). We suspect that the reason for higher resection rates in the HBV group is due to less cirrhosis in the HBV group compared to HCV group [9,14,15,16]. Historically, Asian patients with HCC in the US received more curative resections (40%) when compared to an average HCC patient (15%), possibly explained by a lower percentage of cirrhosis in the HBV group . In a US SEER database derived study from 1998 to 2012, 58,186 patients with HCC were identified, and it demonstrated that Asians had the best chance of receiving surgical resection when compared to the rest of patients (OR : 1.48, p=0.01). In fact, the same study validated the observation that Asians had the lowest percentage of cirrhosis relative to other racial groups such as Blacks (67.1% vs. 78%, p< 0.001) . In patients who adhere to the HCC screening policy, which recommends a yearly abdominal ultrasound along with tumor marker AFP in populations at high risk of developing HCC, there are more HCC cases diagnosed at an earlier stage. These patients are usually healthier at diagnosis and can benefit from curative intent treatments such as surgical resection [16,17]. These patients are also more likely to have better compliance with subsequent follow-up appointments that eventually lead to surgery . Among the reasons for delay of time from diagnosis to treatment, both HBV and HCV groups had similar distribution. Over 30% of delays were related to delayed referrals from an outside facility to oncology and over 20% of were related to the delay of confirmation tests required to reach a diagnosis after the initial oncology consultation. This process can be complicated by multiple imaging studies, which lead to multiple subsequent appointments and a higher chance of noncompliance. Although statistically insignificant, 31% of HBV patients and 19% of HCV patients received a referral from their primary care physicians; suggesting the importance of PCP involvement in the initial diagnosis and timely referral for treatment in viral related HCC. Lower socioeconomic status for patients who resided in underserved area, as defined by federally designated zip codes has been shown to contribute to worse outcomes in HCC diagnosis, treatment utilization and overall outcomes . However, patients with HCV and HBV related HCC in this study had similar socioeconomic status, with 47% of HBV patients and 42% of HCV patients living in underserved areas. In HCC, no studies have examined the consequences of delay in treatment and patient outcomes. Delay in time from diagnosis to treatment in several cancers can lead to adverse outcomes, especially in curative settings. For instance, in breast and colon cancer, when adjuvant chemotherapy is indicated, delay between curative surgeries to adjuvant chemotherapy treatment leads to a decline in cure rate [23,24]. The best curative option for HCC is liver transplant, yet patients with HBV related HCC frequently do not qualify due to tumor size larger than the liver transplant criteria. This trend was observed in our study as well. The other widely accepted curative treatment in HCC patients is surgical resection. In a meta-analysis that included 14 studies conducted in Asia, Europe and the US with 5 year follow up, the overall survival (OS) and disease free survival among HBV and HCV patients who underwent surgery was similar, indicating that early stage HCC patients who received curative treatment could achieve comparable efficacy . On the other hand, our study indicated a trend that compared with HBV patients; fewer HCV patients undergo curative treatments, despite the trend that HCV tend to have smaller tumors and with a relatively earlier stage at diagnosis. It would be important to explore whether such discrepancy between smaller tumor sizes and less curative treatments in the HCV group in a private healthcare setting. It is unclear if longer time from diagnosis to treatment in HCV patients contributes to less curative treatment compared to the HBV group. In HCC patients who underwent TACE due to ineligibility for curative surgery, the outcome in HBV and HCV patients has been studied retrospectively. In a case-control study examining HBV and HCV related HCC where patients were matched based on age, gender, location of treatment, Child Pugh score and tumor stage, no statistical difference in survival was observed [10,26]. When patients with advanced disease which are no longer candidates for TACE were studied and matched for gender, age, location of cancer treatment and modality of HCC diagnosis, the HCV group achieved longer OS with a hazard ratio of 1.62 (95% CI: 1.06 to 2.48, p=0.025) [10,27]. This is consistent with observations from the SHARP study. Among HCC patients who were ineligible to curative or local treatments, sorafenib achieved median OS of 10.7 months; HCV represented 60.4% of the entire patient population . In another phase III study in a HBV predominant patient population, the median OS was only 6.5 months . In a retrospective study of 255 patients with advanced HCC at British Columbia, HCV infection instead of patient ethnicity predicted better prognosis with longer OS in a multi-variate analysis (p=0.04) [28,29]. These data suggest that biological differences exist between HCV and HBV related HCC in advanced stages. HCV related may indicate a better prognosis when treated with sorafenib; the only FDA approved first line systemic medication for HCC. This is the first report looking at the difference in time from diagnosis to treatment in HCC patients based on subtypes of viral hepatitis. The time from diagnosis to treatment among HCV related HCC patients are longer compared to HBV patients. As the most common reasons for delay between diagnosis and treatment were delay of referral from diagnosis to oncology services and the need for additional procedures to confirm diagnosis, we must look for ways to offer patients more efficient care. Efforts to shorten the process of referral from outside institutions and the confirmation steps of diagnosis in viral hepatitis related HCC may help reduce the delay from diagnosis to treatment in both HCV and HBV groups. Further investigation in a private healthcare setting in a prospective manner would be needed to validate the findings. Patients with HCV related HCC wait longer for treatment when compared to patients with HBV related HCC in an urban inner-city hospital (median time to treatment 3.2 months vs 2.1 months). Efforts to reduce time between outside referral to oncology services may help decrease such disparity. Jennifer Wu developed the concept, designed the study, wrote the protocol, organized the data collection, analysed the data and drafted the manuscript. Tsivia Hochman provided statistical design, analysis and edited the manuscript. Judith D. Goldberg reviews the design and analysis, and critically reviewed and edited the manuscript. 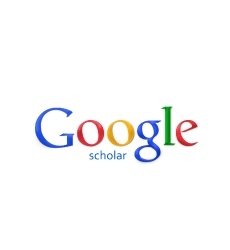 Jafar Al-Mondhiry, Bennal Perkins, Iulia Giuroiu did data collection, Lawrence Leichman provided critical review and gave the final approval of the manuscript. Siegel RL, Miller KD, Jemal A (2016) Cancer statistics. CA Cancer J Clin 66: 7-30. Altekruse SF, McGlynn KA, Reichman ME (2008) Hepatocellular carcinoma incidence, mortality and survival trends in the United States from 1975 to 2005. J Clin Oncol 27: 1485-1491. Liaw YF, Sung JJ, Chow WC, Farrell G, Lee DZ, et al. (2004) Lamivudine for patients with chronic hepatitis B and advanced liver disease. N Engl J Med 351: 1521-1531. Sung JJ, Tsoi KK, Wong VW, Li KC, Chan HL, et al. (2008) Meta-analysis: Treatment of hepatitis B infection reduces risk of hepatocellular carcinoma. Aliment Pharmacol Ther 28: 1067-1071. Kew MC (2015) Obesity as a cause of hepatocellular carcinoma. Ann Hepatol 14: 299-303. Perez JF, Armstrong GL, Farrington LA, Hutin YJ, Bell BP (2006) The contribution of hepatitis B virus and hepatitis C virus infections to cirrhosis and primary liver cancer worldwide. J Hepatol 45: 529-538. El-Serag HM (2012) Epidemiology of viral hepatitis and hepatocellular carcinoma. Gastroenterol 142: 1264–1273.e1. American Cancer Society (2016) Cancer Facts and Figures 2016. American Cancer Society, Atlanta. http: //www.cancer.org/Research/CancerFacts Figures2016. Hiotis SP, Rahbari NN, Villanueva GA, Klegar E, Luan W, et al. (2012) Hepatitis B vs. Hepatitis C infection on viral hepatitis associated hepatocellular carcinoma. BMC Gastroenerol 12: 64. Ng J, Wu J (2012) Hepatitis B and Hepatitis C-related hepatocellular carcinomas in the United States: Similarities and differences. Hepat Mon 12: e7635. Llovet JM, Ricci S, Mazzaferro V, Hilgard P, Gane E, et al. (2008) Sorafenib in advanced hepatocellular carcinoma. N Engl J Med 359: 378-390. Cheng AL, Kang YK, Chen Z, Tsao CJ, Qin S, et al. (2009). Efficacy and safety of sorafenib in patients in the Asia-Pacific region with advanced hepatocellular carcinoma: A phase III randomised, double-blind, placebo-controlled trial. Lancet Oncol 10: 25-34. Singal AG, Pillai A, Tiro J (2014) Early detection, curative treatment and survival rates for hepatocellular carcinoma surveillance in patients with cirrhosis: A meta-analysis. Plos Med 11: e1001624. Waghray A, Murali AR, Menon N (2015) Hepatocellular carcinoma: From diagnosis to treatment. World J Hepatol 7: 1020-1029. Uemura M, Kaseb AM, Abdel-Wahab R, Raghav KPS, Botrus G, et al. (2015) Hepatitis B- and C-associated hepatocellular carcinoma in a large U.S. cancer center: Do clinicopathologic features or patient outcomes differ by the potentially causative viruses? J Clin Oncol 33 : 4011. Davila JA, Morgan RO, Richardson PA, Du XL, McGlynn KA, et al. (2010) Use of surveillance for hepatocellular carcinoma among patients with cirrhosis in the United States. Hepatology 52: 132-141. Singal AG, Li X, Tiro J, Kandunoori P, Adams-Huet B, et al. (2015) Racial, social, and clinical determinants of hepatocellular carcinoma surveillance. Am J Med 128: 90.e1-7. Zak Y, Rhoads KF, Visser BC (2011) Predictors of surgical intervention for hepatocellular carcinoma: race, socioeconomic status, and hospital type. Arch Surg 146: 778-784. Kim AK, Singal AG (2014) Health disparities in diagnosis and treatment of hepatocellular carcinoma. Clinical Liver Disease 4: 143-145. Bismuth HNP, Manjno PE (2000) Hepatobiliary surgery. J Hepatol 32: 208-224. Parkin DM, (2006) The global health burden of infection-associated cancers in the year 2002. Int J Cancer 118: 3030-3044. Ahmed F, Perz JF, Kwong S, Jaminso PM, Friedman C, et al. (2008) National trends and disparities in the incidence of hepatocellular carcinoma 1998 – 2003. Prep Chronic Dis 5: A74. White DL, Thrift AP, Kwawal F, Davila J, El-Serag HB (2016) Incidence of hepatocellular carcinoma in all 50 United States, from 2000 through 2012. Gastroenterology Epub Nov 23. Trufelli DC, Matos LL, Santi PX, Del Giolio A (2015) Adjuvant treatment delay in breast cancer patients. Rev Assoc Med Bras 61: 411-416. Bos AC, Van Erning FN, Van Gestel YR, Creemers GJ, Punt CJ, et al. (2015) Timing of adjuvant chemotherapy and its relation to survival among patients with stage III colon cancer. Eur J Cancer 51: 2553-2561. Zhou Y, Si X, Wu L, Su X, Li B, et al. (2011) Influence of viral hepatitis status on prognosis in patients undergoing hepatic resection for hepatocellular carcinoma: A meta-analysis of observational studies.World J Surg Oncol 21: 108. Catarina MC, Trevisani F, Morselli-Labate AM, Rapaccini G, Farinati F, et al. (2006) Effect of the etiology of viral cirrhosis on the survival of patients with hepatocellular carcinoma. AM J Gastroenterol 101: 91-98. Altekruse SF, Henley SJ, Cucinelli JE, McGlynn KA (2014) Changing hepatocellular carcinoma incidence and liver cancer mortality rates in the United States. Am J Gastroenterol 109: 542-553. Peixoto RD, Renouf DJ, Gill S, Cheung WY, Lim HJ (2014) Relationship of ethnicity and overall survival in patients treated with sorafenib for advanced hepatocellular carcinoma. J Gastrointest Oncol 5: 259-264.